I reckon I will be turkey hunting in the snow tomorrow morning. Snowing pretty good here in Hernando right now. I decided to come on into work today. I am off Friday so I will go after them then. It was cold and every bird in the woods was singing but the turkey birds. I heard 1 gobble at 640 this morning. And the one I killed gobbled 2x before he came in. Things worked out a lot better this morning. I heard several hammering before this one, his buddy, and girlfriend came in. Congrats Bullie. Is that a Ben Lee Super Hen caller? Kinda looks like one but something looks a little different. Bullie wrote: Things worked out a lot better this morning. I heard several hammering before this one, his buddy, and girlfriend came in. Thanks guys. The forest was crawling with hunters yesterday. I just happened to be in the right place at the right time. stickers wrote: Congrats Bullie. Is that a Ben Lee Super Hen caller? Kinda looks like one but something looks a little different. No stickers, that's a Mangum trough call. Just got it couple weeks ago. Gotcha, I saw one of those about 5-10 years ago at Nashville. Is he still alive and making calls? Yep. He is still going. A buddy of mine drove down to pick a few calls up from Mr. Mangum, wish I could have made the trip and met him. He can't cut his own wood anymore and has to pay someone to do that for him. 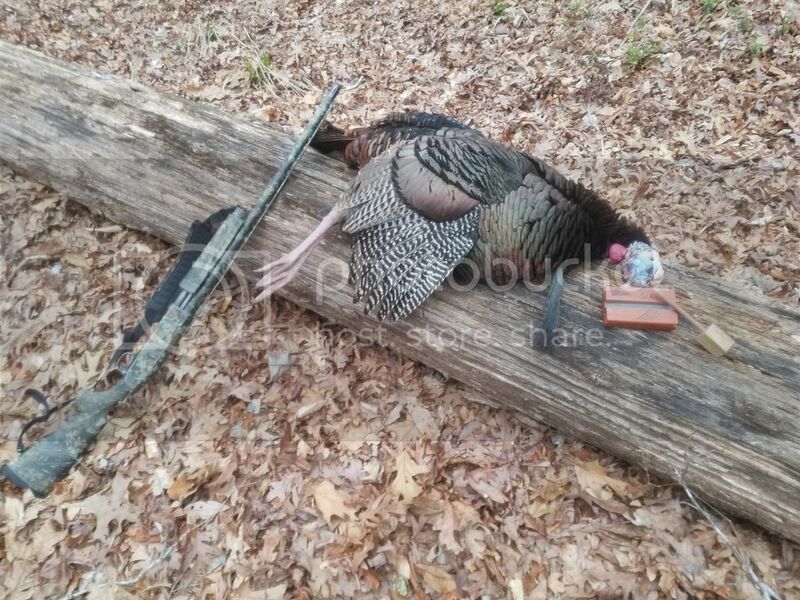 He told my buddy that he believes his quality is going down as his birthdays go up, maybe so, but I found a bird that liked the way my call sounds. Gotcha. I imagine given his age it is his hearing that is going down but not the quality of the call, ha. Once again congrats and a compliments on the nice call.